This cd sounds horrible. Lack of definition. Lack of bass and boosted mids to the point of distortion. Way too loud. Does anyone know if the vinyl is the same mix / master? Does this reissue come with a poster (like the original)? Finally this album is reissued on vinyl, damn that took forever. Now I don’t have to pay upwards of $75 to get a vinyl copy of this masterpiece. I just bought this yesterday (as well as “Grin”) and let me tell you if you are wondering how the sound quality is, well it’s fantastic. Noise Records has done a great job recently with their vinyl reissues and I’ve bought quite a few in the past year (3 Celtic Frost LPs, 5 Kreator LPs, 2 Tankard LPs and 2 Voivod LPs) and they all sound fantastic. I highly recommend getting these vinyl reissues if your a fan of this band or any of the bands I mentioned. 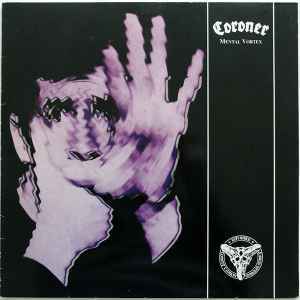 For the price of a brand new Coroner vinyl reissue on colored vinyl it’s definately worth the money and then some. Highly recommend! I wasn’t even a HUGE fan of “Grin” before but after hearing it on this vinyl reissue with the beautiful dynamics on display I have been converted and I now love this album. Just go buy them and hear for yourself.